When I had a real home with outdoor antennas I used to like grid hunting on 144Mhz SSB and CW. I also worked several satellites. I still get on and have regular conversations with my Elmer, WG2B. Luckily, we’re close enough that I can still have reliable contacts with him using a home brew 2 meter Moxon Antenna. I had tried several different variations of indoor wire antennas for 2 meters but once I built the Moxon I was able to use a gain antenna with some directional characteristics. Moving to the Moxon design also saved me quite a bit of space. If your planning on experimenting with Moxon Antennas there’s one essential tool you’re going to need. 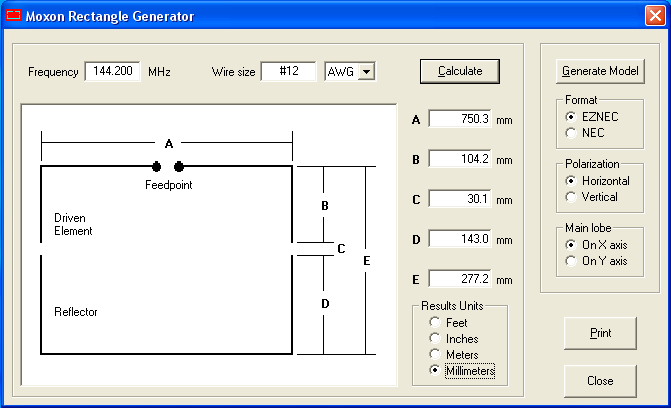 Dan Maguire, AC6LA has made an application the calculates all of the dimensions for any Moxon Antenna. It’s called MoxGen and is freely available from his site. Once you have the programs zip file just extract it and click the application inside. There’s no need to install anything, the program just runs from the exe file. With the program running, simply input the desired operating frequency and click calculate and the program will calculate all of the element lengths and spacing gaps to build your antenna. You will notice that I have mine calculated in millimeters based upon the attached image. Because the spacing and gaps in a Moxon are so critical, I use a 4 foot steel ruler that’s graduated in both us fractional and metric. Using millimeters lets me do all my layout without the risk of errors converting from decimal US units to fractional. With the steel ruler being graduated in centimeters, all I need to do is move the decimal place 1 space to get my working dimensions. Most Moxon antennas are built for HF frequencies and use wire and fiberglass rods as spreaders. Most Moxon antennas are built for HF frequencies and use wire and fiberglass rods as spreaders. I wanted my 2 meter version to be free standing and rotatable so I built mine with brass tubing on a center, non conductive boom just like a beam. The tubing I used is 5/32” OD with a .032 wall thickness and fits perfectly over the 10 gauge copper wire I used for forming the corners of the Moxon.